Hello dear ones. 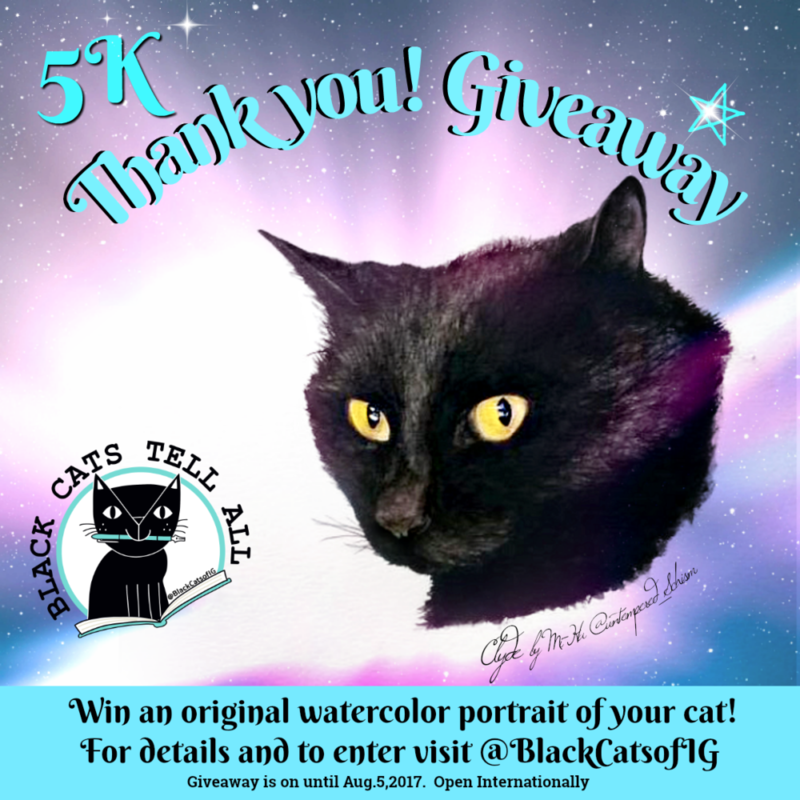 It’s your one-of-a-kind black cat Clyde with a fab giveaway. You know that expression: Be original, everyone else is taken? Cats don’t need reminders to be themselves. We are original and there is nothing better. That applies to art too. The best print or photograph in the world does not compare to an original painting. Original art contains an intangible soul you can feel when you see it and hold it. The magic is in every brushstroke. Wouldn’t you love a soulful, original painting of your cat? 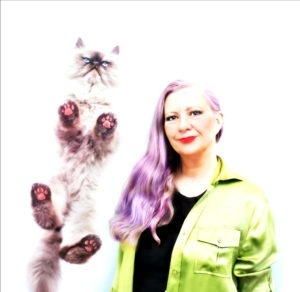 I’ve been immortalized in watercolor by U.K. based artist Mi-Ha and your cat could be too! The original watercolor is winging its way across the pond as we speak. This is kind of what it looks like. She captured my cute devil-horn ears purrfectly, don’t you think? Layla sent a few photos to the artist. We discussed my personality and other details. I can’t wait to see the original. Meanwhile, we’re having a quick giveaway. The winner will be announced here next Monday. But why wait? You could snap up an original for the price of a print for a limited time. She’s young, talented and just starting out. I found her very professional, polite and easy to work with. If you have any questions, message her on Instagram at @Amber_Blackberry. Mi-Ha will be setting up her Etsy shop soon but you can check out examples of her work now. Amber and Blackberry, her black cats can be seen posing with their portraits. It gives a sense of the size and style of her art. One winner will receive an original watercolor portrait by Mi-Ha. Check out her work at @untempered_schism. Size A4 or 8.3 x 11.7 in. watercolor paper. This giveaway is open internationally and includes free shipping. Includes a consult with the artist. The winner must supply a suitable photograph of their pet. To enter the giveaway, leave a comment telling us who you would like of portrait of and why. Visit and follow us on Instagram at @BlackCatsofIG where you can also enter and gain additional entries. If you are not on Instagram, leave a comment here, share this post and tell us where you shared. This giveaway is on until 11:59 pm ET, Aug. 5, 2017. The winner will be notified privately via email and/or IG DM and announced at this blog on Aug. 7. 2017. Good luck! If you don’t win, you could commission an original watercolor size A5 (5.8 x 8.3 in) for as little as $25.00 U.S. plus shipping. FTC: disclaimer. This giveaway provided in exchange for an original watercolor. No other compensation is given and all our opinions are our own. At Cat Wisdom 101, we only share content we feel is of value to our readers. Oh we would love to have a portrait. If I won I would love a picture of my soul kitty BearBear who went to the bridge. If we won, we’d like to have a portrait painted of Sweet Praline. Mom Paula has portraits of her first cat and of us, but nothing of Praline. Hey there, Clyde! Thanks for sharing with us about Mi-Ha and her wonderful watercolors. We would love to get a painting of Zoe or Gracie, who are housepanthers like you. It would be great to see what essence of their personalities Mi-Ha captures. Hugs to you and Layla! That is a beautiful painting of Clyde. II would absolutely LOVE to have a portrait of the Queen! (Penelope that is). Yes, I do paint, and yes, I do portraits but every artist dips his brush in his own soul and paints their own nature into their pictures! She will see things in Penelope that I do not and for that I would be eternally grateful! Original artwork is a most special thing to have as a gift……one thing I was never able to “master” as an artist was the ability to capture personality of humans and animals in my work – this painting of Clyde does that I think quite beautifully! I would love to have an original portrait of Angel Sammy – while Teddy has filled my heart again, Sammy fills my mind with memories. Thanks for the opportunity Layla! I would like a portrait of my cat Cali. She went to the Bridge and we miss her very much. I would love to have a picture of my special boy who passed away many years ago. I have a special picture of him that I would love to have as a pet portrait. Thank you for this opportunity to win. There are so many cats I could want a portrait of but I have one of my beloved Tan’na already that was drawn by me many years ago… back when my hands were still steady. I wish everyone else the best of luck so am here just to say how stunning Clyde is. I would love have a portrait of my cat, Tully! I would like a portrait of my two black kittens because I love them. It would be hard for the mom to decide which one of us would get the watercolor. She needs to get 3 of them! Hi, This is Finnegan, also known as ‘Mr. Greedy Guts’ to my fellow housemates which include 2 hoomans and four other cats. I would love to have my pet portrait done so Mummy can remember that I am the King of the House and all hers. Maybe then she would stop petting the other cats! I would love a portrait of my Velcro, she left me last November and I miss here very much. Wow, that is an awesome watercolor! I’d like one of ME… but my human says maybe she would rather have one of… BINGA?! She says Binga is older and I already have art of me. Oh well, I GUESS I see her logic, but still. 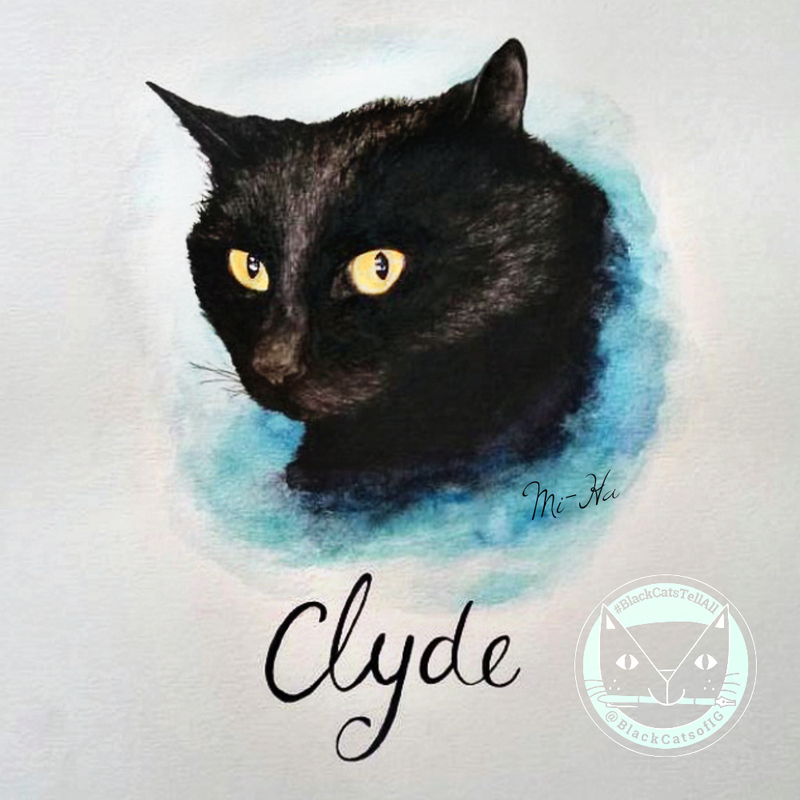 The painting of Clyde is gorgeous! If I had to choose between my two mancats, which is very hard to do!, I would love to have Panky’s paw-trait done. I forgot to include why I’d love an oil painting of Panky. All the cats in my life were black. I had 3 wonderful panfurs in the 80s. Had Dalmatians from 1996-2011. Panky appeared in my life just before Cherie the Dal left for the Rainbow Bridge. That’s really interesting. I’m not sure if Mi-Ha works in oils but you could ask. Sweet! Clyde we think the painting will be absolutely gorgeous! We would have a hard time picking out who to have painted but it would be a great pleasure to have the honor of doing so. Wow, what an incredible, incredible deal. And honor. You are the best, Layla. Mao would love it, as he is now in ATL with daughter, and he misses Ched. Thanks for the chance! Does it have to be a black cat? If not, I would LOVE to have one of Cody. I cherish original artwork and as he gets older, even more so! I would have a watercolor of our Cracker Jack. He is a rescue who we refer to as our prize in a box. He is one of the most striking cats you would ever lay your eyes on. He is a black Persian mix and just stunning with his silky black coat and yellow eyes. He is one of 8 in our household and one of a rainbow of colors we have. All are rescues and loved dearly. Have you posted any pics of Cracker Jack lately? I adore him. I have 3 cats , so it’s hard to choose which one will be painted. I would like to have a portrait of my cat , Ryder, because I have the most pictures of her. What a gorgeous painting of Clyde! I’ll bet the artist could render a stunning one of me cos I’m the world’s most stunning cat, of course. I would absolutely love to have my beautiful black kitty cat J.J. in a painting on my wall. He died in May 2016 and I have missed him every day since. I was lucky to have spent 10 special years with him and look back on those years with a smile on my face. 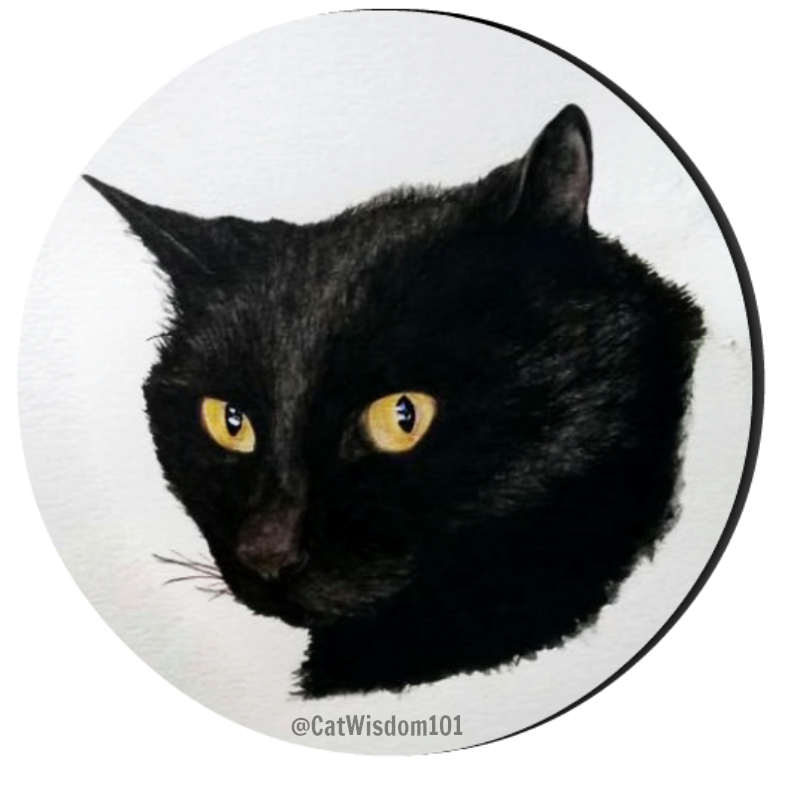 I forgot to mention this in our post how commissioning a pet portrait before or after a death is a special memorial keepsake. I’m sorry for your loss. I also lost our beloved cat Merlin in May 2016.